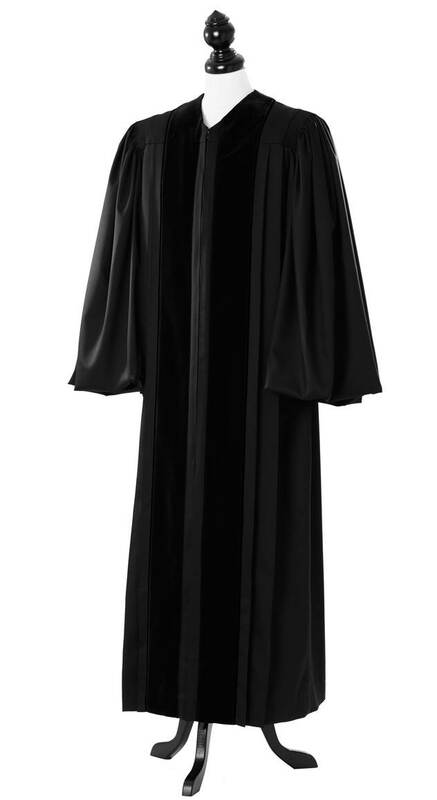 When purchasing a John Wesley Clergy Robe, you should especially pay attention to the material quality and the material processing! We stand for timeless fabrics and traditionally customized models which meet the highest quality expectations. Our materials are subject to exclusive standards which we constantly examine in detail. In spinning the wool, our manufacturer use particularly long-fibered wool which produces yarns of the finest quality. This enables us to obtain cloths with very few protruding fibers that are extremely comfortable to wear. Merino virgin wool is the best pure new sheep's wool; it is breathable, durable and wrinkle resistant. 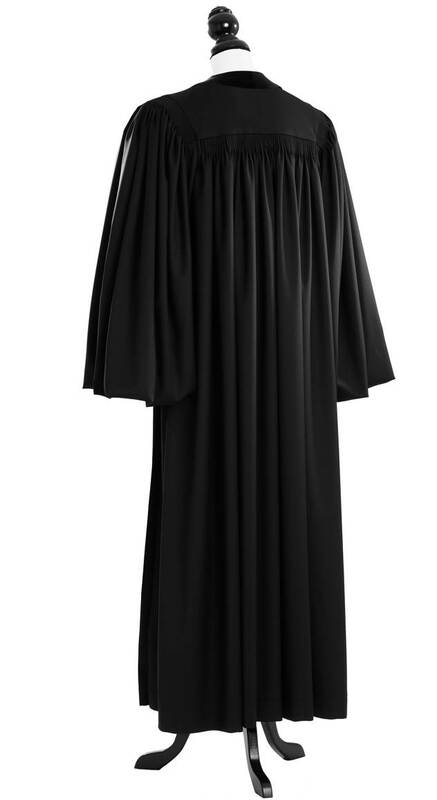 Our John Wesley Clergy Robes correspond to the highest expectations of our customers due to the particularly precious raw materials we use, and lend the office bearer a stylish, elegant appearance. TIMELESS | bespoken silver wool cloth at 225 g/m (150 g/m2) is yarn-dyed and is manufactured specifically for TIMELESS robes from high-grade, extremely fine Merino worsted woolen yarn according to customer request. In order to meet the highest requirements, this yarn has conditioned crease-resistant and extremely hard-wearing characteristics. It can be described as extremely light, fine, luxurious, and soft to the touch, and it also falls elegantly. Our luxurious royal regalia cloth is woven from 95 % fine Merino new wool and 5 % elegant cashmere at 150 g/m². Cashmere is one of the most valuable materials among wool products, and is obtained from the soft underhair of cashmere goats. Cashmere is climatized, very light and soft, and lends a slight shimmer to black cloth. Woven from superfine Merino wool and silk, TIMELESS | bespoken gold silk cloth offers the ultimate outer fabric for the most exclusive robes. The textile consists of 77 % Merino wool, 23 % silk – TIMELESS | gold silk at 240 g/m (160 g/m2), is yarn-dyed, and woven from superfine Merino worsted wool yarn and stylish spun silk customized especially for our robes. Woven from superfine Merino wool, the SCABAL CAPRI from 100% Wool Super 130 S at light weight 260 g / lfm (173 gr/m²) offers the sensational outer fabric for high exclusive robes. As a natural product, Scabal CAPRI Cool Wool has an amazing ability to keep you warm when it's cold, but during the summer it will help take moisture away from your body, helping regulate your temperature. The collection of Holland & Sherry´s Luxury Merino wool Super 120’s suiting is based on classic British styling with a contemporary twist. Two types of weave have been used; a 2/1 prunelle based structure which offers more scope for design and creativity, and a 2/2 twill based structure for the well balanced classics All cloths selected are woven from a 76/2nm yarn count in both warp and weft directions, offering strength and stability The cloths have been finished with a process named London Shrunk. Developed 100 years ago it is typically known as The ultimate suiting finish. The SUMMER TASMANIAN collection of Loro Piana from 85% wool and 15% silk Super 150 S fabrics at summerlike 210 g/m. This especially fine Merino worsted woolen yarn meets the highest requirements, this yarn has conditioned crease-resistant and extremely hard-wearing characteristics. It is extraordinary light, fine, luxurious, and soft to the touch, and it also falls very elegantly.